Didn’t You Alway Wonder Why It’s Called Marshmallow? 4000 years ago, Egyptian royalty favored a confection made from honey mixed with the sweet, sticky juice from a flowering plant that grew in marshy areas. Later, eighteenth-century apothecaries used the same extract, cooked with sugar and egg whites and then whipped, to sooth sore throats and coughs. The extract was also used on burns, scrapes and minor cuts. 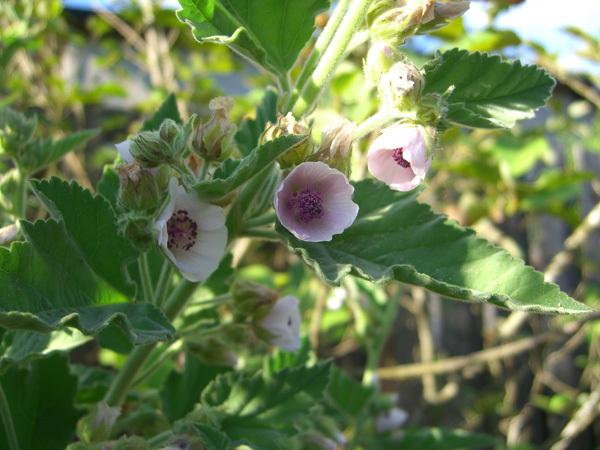 The plant, of course, was Marsh Mallow (Athaea officinalis). Nowadays gelatin has replaced the Marsh Mallow extract in marshmallows (the candy). There’s no egg any more, either. Marshmallows are made from gelatin, corn syrup and corn starch, whipped and with air “jet-puffed” in. Marsh Mallow (the plant) has naturalized in the Eastern US, where it grows wild in many areas. Here in the Pacific Northwest, it makes an unusual, rather exuberant garden plant. I use the sap, along with lavender, rose, mint and rosemary, to make an after-shampoo rinse for my hair. I’ve never tried making candy from it, but I’ve been tempted. 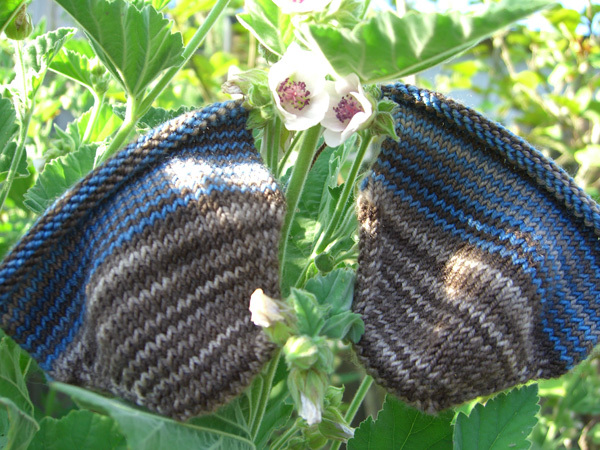 My latest pair of sock toes are enjoying the Marsh Mallow. This is STR in Mudslide (the brown) and Stonewashed (the blue). I’ve dubbed these the “Mudstone” socks. I’m knitting them in a spiral stripe — i.e. work one round of color 1, drop color 1 and work one round of color 2, drop color 2 and work one round of color 1, etc. I made the toes brown after polling the teenagers who were at Tangle last Saturday. I might make the heels blue. I haven’t decided what to do on the legs yet. Well… I have an idea but I think I’ll keep it to myself until I can work it out a little more. And, just in case anyone was wondering, keeping 4 strands of yarn untangled is the pits.